and rear Dynatrac™ 60 axles and 39.5-inch BFGoodrich Krawler tires turn this Jeep® Wrangler JL into the ultimate Desert Racer. 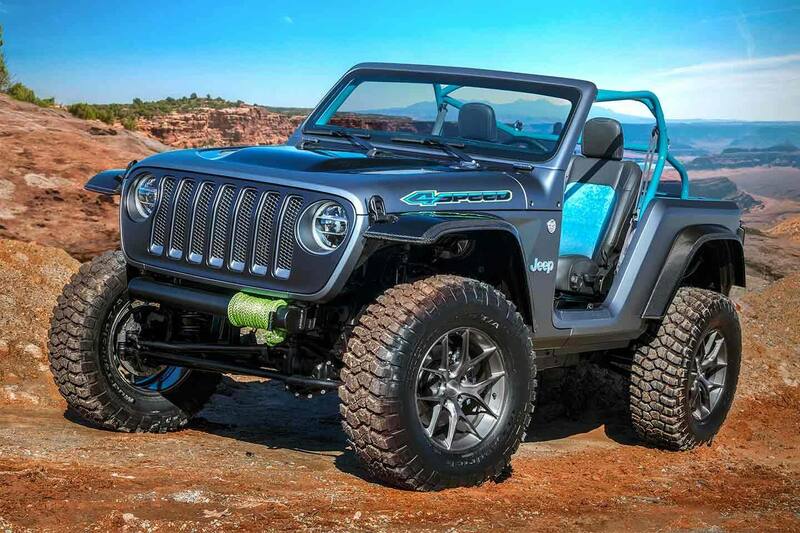 The Jeep Sandstorm features custom Baja styling cues like a vented carbon fiber hood, vented high clearance front and rear fender flares and chopped exterior handles and swing gate for a cleaner look. Leather-trimmed front seats and distinctive low-back racing bucket seats in the rear bring a Baja race track feel to this massive off-road machine. Lightweight construction meets powerfully nimble performance. The Jeep® 4SPEED features a carbon fiber hood, high-clearance carbon fiber fender flares and a carbon fiber rear tub with perforated aluminum panels. The 4SPEED boasts a sleek side profile courtesy of a raked windshield, elongated door openings and an aggressively swept back custom frame. Powered by a 2.0L Turbocharged engine, the 4SPEED is truly built for speed.